Chris Alexander provides his clients—from small startups to multinational corporations—with condensed legal solutions for their complex legal problems. Businesses operate across a spectrum of risk, and Chris handles all manner of business pitfalls and potential hazards. He counsels his clients through the difficulties of exposed risk from start to finish. With a passion for business and a background in chemistry, Chris employs technical analysis to provide his clients with the resources and knowledge tailored to their business. Chris has more than five years of experience representing business owners and corporations through all manner of business disputes from product liability actions and commercial disputes, to employment-related issues. 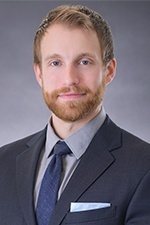 During law school, Chris worked as a judicial intern for the Honorable John H. Guthmann, Chief Judge of the Second Judicial District, Ramsey County, Minnesota. He continues to serve on several boards, including Northern Film Alliance—an independent film initiative—and Code Savvy—the 2017 Tekne Award winner for STEM Education. Chris is also an active member of many small-business organizations throughout the Twin Cities. In addition to being admitted in Minnesota and Illinois, Chris regularly represents clients pro hac vice in numerous state and federal courts throughout the country. Chris devotes time to raising future service dogs through Can-Do-Canines. He also enjoys helping his entrepreneurial friends make their dreams a reality by organizing and registering entities to suit their business needs.